Good afternoon, or morning, or evening, from Toledo! Not the best pic, but my balcony view! So…it’s been two months since I wrote anything on this blog. Yikes. I think any “travel blogger” (or in my case, wannabe-travel-blogger) commits to writing a certain amount of posts before they take any big trip. But then, we actually get to our destination, and the adventure just takes over. Whether you’re cruising the Mediterranean, hiking the jungles of Brasil, or building a life in a completely new country, it can be hard to remember to post. No worries to the few people who actually read this blog, because I am back, and pledge to write more every week! I work 24 hours per week (the maximum number of hours assigned at random by the BEDA program) at a concertado, which is a school that is half-public, half private. Some things are paid for by the local authority while some are paid for the families who attend. I have 24 different classes of students ranging from 7 years of age to 18, from 2nd Primary to 2nd Bachillerato. In the Canadian education system, this translates to kids from Grade 2-12. It’s sometimes difficult to manage activities and games for such a diverse age range, but I love to prep for my classes and discuss ideas with my fellow teachers. They are all very sweet and eager to practice their English, but are also gracious in allowing me to practice my Spanish with them too! Every day we have a “coffee break” in the staff room which makes me feel super professional, haha. I am able to chat with the teachers there and we also have lunch together. I may work more hours than some of my other friends in different programs, and work Monday to Friday, with only weekends off, but I am really enjoying it and feel that teaching is, in some form at least, my true calling. 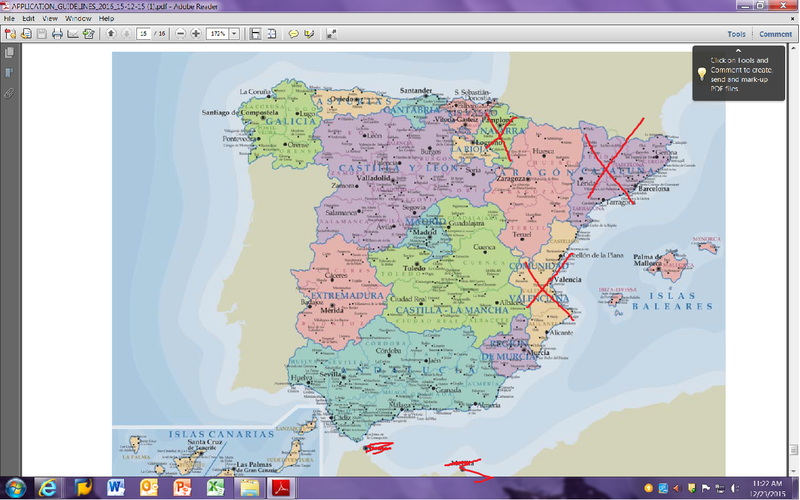 A map of the regions of Spain! Compared to Canadian cities of the same size, the cost of living in Toledo is fairly cheap, and the monthly stipend provided by my school is definitely enough to cover basic expenses like food and rent. I have leftover cash to go out with friends and grudgingly pay my student loan back at home since I wasn’t able to defer it. However, most people come to Spain with the plan to travel around Europe, which is half the fun! While I did save money before I came, I also took up the practice of doing clases privadas here in Spain, all gained solely by word of mouth from my fellow teachers. Basically, I spend around an hour with each person (mostly children aged 8-15) providing English conversation practice. Education here in Spain is great when it comes to grammar and such, but like any language, English is best learned by speaking out loud! Parents know their kids can be shy in a class of 25+ and so they often get native speakers to provide this conversation time and pay a fee. I have 10-11 clients (depending on their schedule sometimes) that I do this with every week from Mon-Fri. Some of my friends also do lessons at English academies in their free time. It’s a necessary thing to do here if you want to save some money, but I really enjoy it! I also spend a lot of time with my roommates, who are all Spanish and don’t speak too much English. But I don’t mind, because my Spanish has improved immensely, even in just two months! We watch TV together and hit the gym, which has been an interesting experience on its own, without the foreign language thrown in! The families of my private-class kids have also been super welcoming, often making me a meal or snack while in their home. My roommates and I at the bar! Between teaching, private lessons, prepping for lessons, hanging with my friends, hitting the gym, and doing normal person things like, ya know, eating and sleeping… I’ve been trying to maximize what little down time I have by improving my Spanish! I got a library card to take books out in the target language instead of buying them, and that proved to be a big help, because the first book I checked out (a young adult novel) was written at a much higher level than I can comprehend. I have around a B1-B2 level in Spanish, which is to say, fairly conversation and can discuss a wide variety of topics with ease, but still not fluent and lacks significant vocabulary or grammar poignancy to be considered fluent. In order to learn more vocab, I borrowed some primary level books from my school, notably The Adventures of Geronimo Stilton. I comprehend about 90% of the books, and although they’re a bit infantile, I love using the context of the words I know to learn new ones. Another favourite tactic of mine to learn is to watch TV with Spanish audio and Spanish subtitles. I’m at a good enough level to understand most of it, but if I have the Spanish subs on, it forces me to read it and think, not just see the translation in English. I find it helps to watch shows I’m familiar with already, like The Big Bang Theory, Spongebob, or The Simpsons. But down-time with a lazy brain is also important. I finally watched Stranger Things and loved it, I watch Vine compilations a lot (RIP VINE), especially when I’m feeling down. I read books in English, write poems, research travel destinations, and make pros and cons lists of options for teaching/living abroad in the next few years. A big thing among expat friends here is that we feel we always have to be doing something because, duh, we’re in SPAIN and should be maximizing every moment! But we’re also in Spain for seven more months. There is time. If you’re in a similar situation, just breathe, and take time for yourself. This is getting pretty lengthy, so without going into detail, I have also: traveled to Portugal (my fourteenth country! ), gotten a really terrible cough AND food poisoning, navigated the Spanish red tape of getting my ID cards in order, been to the hospital (for the terrible cough, I didn’t know how to make a doc appointment), been to a Maluma concert in Madrid, went to a few Spanish National Day events, cooked a lot more for myself, embarrassed myself countless times at the supermarket, and stayed awake until 5am partying Spanish-style. I love it here, and encourage anyone who has a similar dream to go for it! Wow, it sure has been a long time since I posted on my blog! This stems from the fact that I declined my BEDA offer last year and instead opted to stay here in Ontario to make some money. Did it turn out to be a good decision? Honestly, I’m on the fence about it. I really do like my job (and its benefits), I’ve met a lot of great friends through work, and I’ve been able to save some money this year which can hopefully go towards a job in Spain in September/more travels. But in contrast, I’ve also been shivering away during yet another Ontario winter, wishing I was eating churros and watching futbol in a tiny bar in Galicia (the place I was supposed to go to with BEDA!). But as they say in El Sal, #socks: eso si que es. I’m back with news though: I’ve applied to both BEDA and Auxiliares de Conversacion for the 2017/2018 school year! I never really planned to stay long here, but I did want to earn some money so that I’d be more comfortable if I did move abroad soon. Here’s hoping I get a job with either one, and here’s an update on both! Auxiliares de Conversacion: Last year I ran into a few problems with my application for the known-to-be-disorganized ADC program, which I wrote about here and here. Today I finished my application for the 2017-2018 year, and I’m inscrita (application number) 715. I wanted to be earlier, but I forgot that the applications opened on January 9th at midnight SPAIN time, and not Ontario time. Still, I submitted it, and 715th is not too shabby. I’ve heard that generally return applicants get their first choices and then it all trickles down through the ranks from there. Surprisingly, this year’s application offered not only a choice between your top 3 Spanish autonomous regions, but an option to select Andorra as a first or second choice over Spain. As far as I know, this is the first year that Andorra has been open on the program. I picked it as my second choice, because I really do love Spain, but if I got placed in Andorra I wouldn’t be disappointed. Applications officially opened today and go until 18th April 2017, but placements are on a first come, first serve basis, so apply now if you want one here! Both programs start giving placements around the end of April/beginning of May, so you may not hear anything for awhile about that, but if I have any updates I’ll be sure to post them. I’ll also soon be writing about a recent trip to Cuba that I took, which was my first big trip since my 2015 China disaster. I have trips planned in 2017 for Cuba (again) and possibly Mexico or the Dominican Republic too. Hopefully September will also be bringing me to Spain or Andorra! Back at it with BEDA! Sticking with my style of doing complete 180s when it comes to life plans, I’ve had a change of heart in terms of teaching in Spain. I wrote a bit about my interview with BEDA here, but I had already basically decided to go back to university and bump up my degree to an Honours, and then go to teacher’s college here in Canada afterwards. But, I received acceptance into BEDA a few days ago, and I felt like I couldn’t say no. Why? A few reasons. One, I feel like I have to try teaching somewhere before I end up committing to a two-year money-draining Master’s program in teacher education here. If it turns out that I go through all of this, graduate when I’m 27-28, and end up hating teaching, it’ll be a waste of my time AND money. Two, school will always be there, but traveling opportunities come with age restrictions and responsibilities. I’m not a parent, home owner, or car owner, and my lease ends in September. What better time to go? Three, I love traveling, and I love Spain. While my China teaching adventure didn’t end up working out, I largely attribute the failure to my lack of proper medication for my anxiety and the language barrier around me. But hey, I speak Spanish, and I’ve already researched that my medication is available abroad. Plus, I was assigned to the beautiful little town of Orense, Galicia, which is a region completely unexplored by yours truly! How could I turn it down? Four is that I love the idea of teaching, and I’m itching to travel again. I want to explore more of Spain, and see other countries I never got to see the first time around. As well, I have some friends I met during my exchange that I miss dearly, who would be easy to visit once I was already across the pond. I don’t want to be sitting in a classroom during a cold Canadian winter, wishing I’d taken the plunge but being too afraid of past failures to do it. We’ve all got to move on someday, and I’m ready to put my unfortunate China experience behind me. P.S. Anyone else get into BEDA or any other program? Let’s connect! As of January 12th, the applications for the Auxiliar de Conversacion program have opened, and I’ve already run into my first problem: a recommendation letter that I requested a couple of months ago isn’t done yet. I’m still waiting and so, I haven’t been able to submit my application yet. Given that some blogs I’ve read said that they were in the hundreds (for application number) just two hours after it opened, and I’m currently 9 days past the opening date, I’m a little worried about my chances for the program. I mean yes, I’d teach ANYWHERE in Spain, but the Auxiliar program runs on a first come, first serve basis for top location choices, so chances of getting one of mine are getting slimmer every day 😦 . So basically, there’s nothing to report for my Auxiliar application for now. My interview with BEDA is tomorrow, and then I’ll probably find out about a placement sometime in April. It operates on the same 9 month grounds as the Auxiliar program, only this time on an extended student visa, so you can attend those classes. Meanwhile, I’ll still be submitting an Auxiliar application once I get my recommendation letter, so we’ll see where I stand in competition there! Is anyone else applying to teach in Spain in Fall 2016?? Hey everyone! I’m currently working on my application to the Auxiliares de Conversación program, which is a program run by the Spanish government that allows recent grads from Canada or the USA to live and work in Spain for a year while teaching English (or French) in public schools across the country. From my readings of others’ blogs, there’s a lot of confusion, frustration, and questions associated with the application process and the program itself, so I thought I’d “liveblog” my experiences as I go through them! I’ve never applied to this program before, and heard about it because I was looking at a similar one in France, but my French is sub par and I like Spain better. Read on for my info and impressions! Any Canadian or American between 18-60 (or 35 if you’re in Madrid), native English or French speaker, with a Bachelor’s degree in any subject, basic Spanish skills (not required I don’t think, but certainly helpful) and willingness to try something new! The program goes for around 10 months (Sept/Oct until May/June) so make sure you’re free. The application for the 2016-2017 school year opens January 12th, 2016 and is available until the end of April, but you can make up your CV and add required documents to the application portal (PROFEX) now. I can be forgetful, so I decided to do it now. I’ve filled out my details and uploaded a copy of my degree and my passport, but I still need to write a letter of motivation (in English or French) and get my recommendation letter. * This should be solicited sooner rather than later, because the applications are a first come, first serve thing, and you’ll want to apply early for your top choices! Here is the website, with all of the information, guides, questions, and translations. *The recommendation letter is supposed to be from any current or former professor, but if you’ve been out of school for 3+ years, you can use your boss. There’s a more detailed letter guide on the application website. However, even though I just graduated 6 months ago, I decided to use my boss at the library where I voluntarily taught English while I studied in Spain, because I thought it might sound better coming from a place where I taught already. I’m hoping I won’t run into any issues using her instead of my prof (who doesn’t even work at my uni anymore), but if I do, I’ll give a heads up to you guys! So my first impression with the website was that there is a LOT of information, and the application guidelines definitely seem confusing. There are some documents that need to be mailed to consulate offices, some that need to be uploaded online, and a lot of them have specifics that need to be followed, or they won’t be considered. I can see why people say it’s a little intimidating, but my advice is to read through the guidelines a few times, and keep the PDF open when you’re doing your application. It’s all in Spanish, but the guidelines are in English and have arrows to point to the parts you need to fill out. I filled out my PROFEX details just to have it done for now, even though the application opens in 2ish weeks. The info you need is basic (personal details like date of birth, passport, etc). It seems like you need to already have a passport when you apply, since it’s one of the required fields, so if you don’t have one… get one! Mine expires in January of 2017, so I’ll probably have to renew it. I uploaded a few documents too, but I’m going to set aside some time to write my motivation letter later. Another thing I did was take a look at the map of Spain (at the bottom of the Application Guidelines PDF) to see which regions I’d like to work in when the application opens up. You can pick 3 regions as your top choices, but nothing is guaranteed, especially if you send in a later application. They’re also organized by group, and you can only pick one from each group i.e. Group A is Asturias, Extremadura, La Rioja, or Pais Vasco. Some regions like Catalunya don’t participate in the program. 😦 Also, you can only choose regions, not cities, and from what I’ve read, you could be placed in a big city like Madrid, or in a tiny village in the middle of the countryside! Madrid teachers get 1000 euros a month for 16 hours per week of work, while anyone else gets 700 euros for 12 hours per week, probably because of cost of living. Printscreened from the application, with my edit. **Apparently Castilla La Mancha has also pulled from program. I might be over-preparing a little bit, but in my experience, it never hurts, and I reaaaaaally want to go back to Spain–one of my fave countries–to teach, one of my fave things! Stay tuned for more of my application adventures as the year goes on, and buena suerte to anyone else applying to be an auxiliar! Have you ever taught abroad, or even better, been an auxiliar? Tell me!